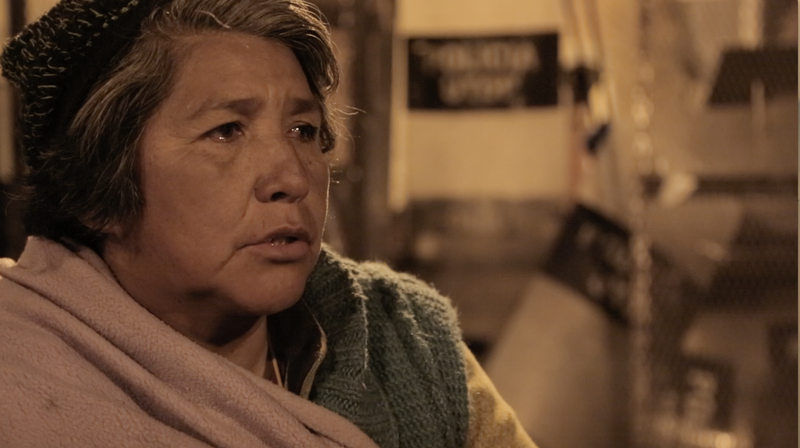 Rosemerry Guarita lost her dentures during the first protests by people with disabilities in Bolivia in 2012; she was biting a police officer who was trying to hurt her. "Everything we have today is thanks to that fight." During this years protests though, she's changed her strategy. With one hand she pulls the police shields aside, and with the other hand, taking advantage of the height of her wheelchair, she grabs them where it hurts the most. "I was squashing their balls, that's how we pushed the back." She says laughing cheekily. It was thanks to her new technique, that Rosemerry won a battle against the dozens of police officers who wouldn't let her hang herself from the bridge in the center of La Paz. After the wheelchair protestors forced the police back off the bridge, with Rosemerry leading the way, she took off like Super Girl, rolling down at full speed with a lilac cape hanging from her neck to hide the hooks and rope needed to hang herself from the bridge. Once she got to the road, the others dropped down the rope. The police cut the rope three times, but she kept trying. " It's my human right to protest, for 25 years I've lived in this wheelchair without dignity. Now I'll hang myself for all people with disabilities that remain hidden in their homes, I'll hang for all the people who can't be here." "I ended up full of bruises, but happy, I couldn't imagine in my wildest dreams that I'd spend my 48th birthday hanging 20 metres above the road with the whole country watching." Rosemerry was born in El Chapare, her family are coca farmers in a little town called San José in the tropics. When she was a girl, she met a young leader who taught her to always fight until the end. "He always wore a white shirt and a towel around his neck," she remembers. "Can you imagine? That leader was Bolivia's first indigenous president, Evo Morales. I've always voted for him, even in the last referendum, I voted yes! How could I possibly imagine what he'd do to us?" Rosemerry's mum died when she was twelve years old, so she had to grow up fast to look after her four younger siblings. Years later she moved to Cochabamba where she met the father of her first son, "I was a single mother by the age of twenty." She says with a little bit of sadness. On one particular trip back to El Chapare, she met Rodolfo, who fell crazily in love with her. "Rodolfo didn't conquer me, he conquered my son Michael" she laughs. A year later, Rosemerry and Rodolfo got married and they had another two children and now they have two grandchildren. Rosemerry opened a corner store and every week she filled it with merchandise she bought in the market. One day she tried to carry a big bag of rice home on the bus, but the driver dropped her a long way from her house, and she carried it on her back. That night, her back began to hurt, but she didn't take much notice until days later when she fainted. The doctors first diagnosed her with rabis, they carried out all sorts of tests, she went from hospital to hospital, until a doctor decided to take liquid from her spine to find out what was wrong. It was at that point it was discovered she had Tubercular Meningitis, " If I didn't hurt my back with the bag of rice, maybe I wouldn't have found out until it was too late." She was in the hospital for a year and everyone believed she was dying. "I don't remember a thing, then one day I woke up thinking about my baby daughter, they told me she'd inherited my illness and was also in hospital." Everything was too expensive and her husband couldn't pay for both of them, so he decided to take the little girl home from hospital. "When I finally got out of hospital, my husband had sold everything and we decided to move back to my house in El Chapare. The day we arrived home, my ten month old daughter died in my hands, simply because we didn't have enough money." 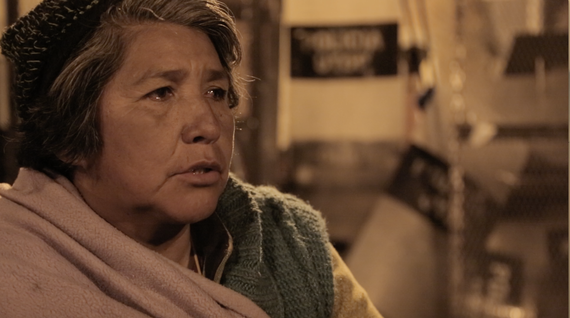 Rosemerry couldn't overcome her sadness and they went back to Cochabamba. There, with her crutches, she started to sell plastic bags in the market " I was never embarrased, people bought my bags, because they felt sorry for me." She began making carry bags from potato sacks and a year later she bought her own shop in the market where she sold wallets, belts, underpants, books... She sold everything. "I'm hyperactive, I can't wait for things to happen, I always have to be doing things!" says Rosemerry. Every year, she loses more mobility. One day it was announced in the radio, a meeting for people with disabilities and without thinking she went. 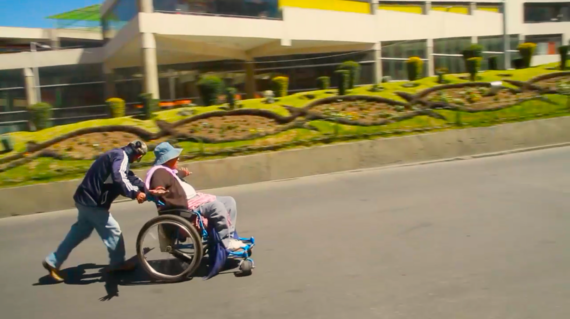 She became a leader of the 'Comitee of Protection of People with Disabilities' in Cochabamba. In 2012, a group of people with disabilities decided to take to the streets and protest and Rosemerry was among them. "No-one told me to, it was my decision to join the fight because we can't continue living like this." After everything that happened Rosemerry severly burned her legs, "Kitchens here aren't made for people in wheelchairs, there was a splash and the hot water spilt all over my legs." In the public hospital, the nurses only gave her painkillers and her sister had to send $10,000 from Spain so she could have a skin graft. "It was hell, what I lived through at that time. How many people suffer in their houses! When the government says, we are living a financial boom, that we have free health, free education for people with disabilities, it's all a lie!" Says Rosemerry, with the conviction of someone who never gives up. Rosemerry is convinced the only way people with disabilities in Bolivia have a chance of survival is by getting a monthly pension of Bs. 500 ($71 USD). The kicks from the police, her fear of heights, her age or her deteriorating health haven't been able to stop her. "I don't know where I get my ideas or the words when I speak to the press, they just come to me," she says inspired. "When there's injustice, I feel I can do anything, I become a lion, but I'm also a very sensitive person. I'm so sad for all the people with disabilities who haven't had a chance." Everyone respects her, including the other leaders in the protest. 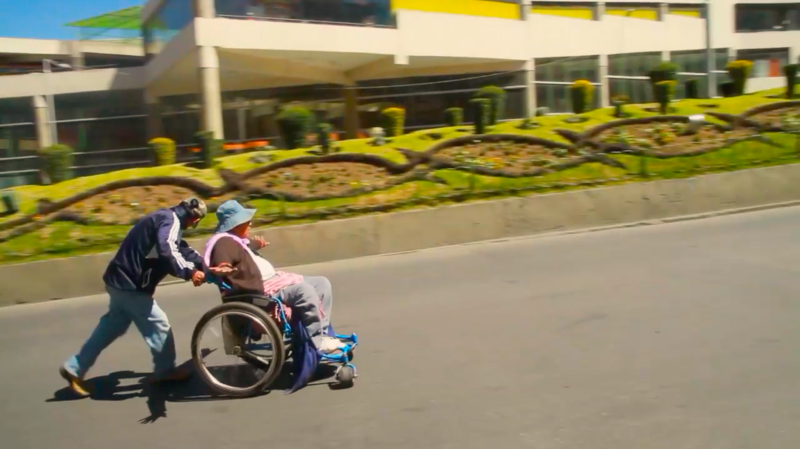 When they want to give up, they worry that she will think they're cowards "After all this, I've lost all my fear," says Rosemerry, convinced that her fight will end the day people with disabilities can live with dignity in Bolivia. * Part of a series of portraits of a collective of people with disabilities who have been fighting for more than 170 days on the streets of Bolivia. They're asking for a monthly pension of $71 (a quarter of the minimum salary in Bolivia). During confrontations with the police people with disabilities have been gassed, attacked with water cannons, thrown from their wheelchairs and kicked on the ground amongst other violations of their human rights. On June 10th, two people were killed when a drunk driver drove through the middle of their camp while protesting in Cochabamba. Two orphans were left behind, one with a severe autism. 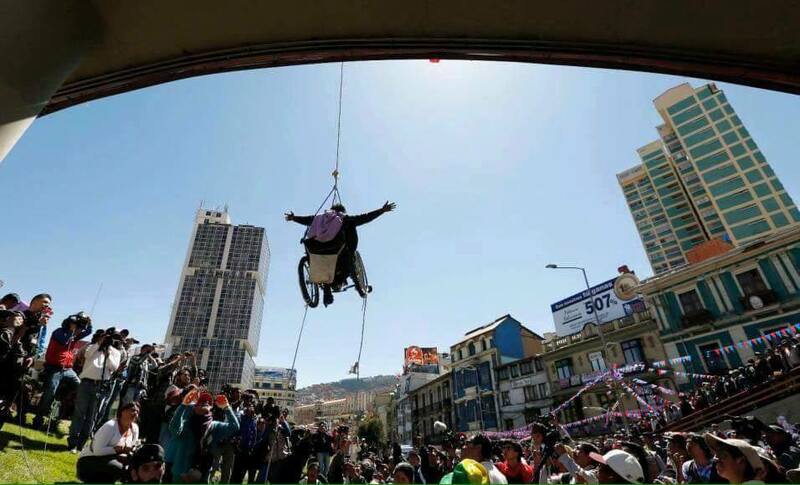 Bolivia's minister of communication, Marianela Paco, blamed the wheelchair protestors for the two deaths. Bolivia's President Evo Morales told a news conference on Friday, June 24 "We can not give a pension to the disabled, we have to look after the national economy", however the yearly budget of the ministry of communication for propaganda is 70 million dollars, a third of this budget would be enough to cover the annual pension for the 23,000 people registered with severe disabilities. The collective of people with disabilities continue their protest sleeping in the streets. The entry to Plaza Murillo, where the government offices are located, is blocked by a three meter high barricade, that is guarded by several hundred police officers with tanks. 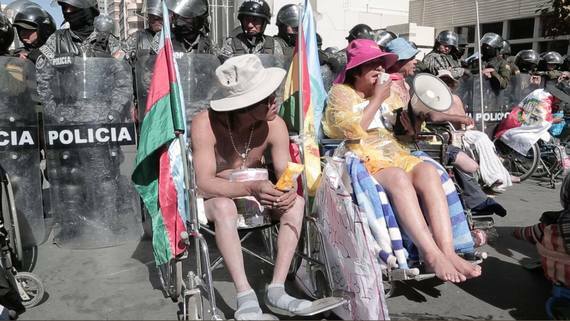 The police have been ordered by President Evo Morales not to let people with disabilities enter Plaza Murillo.